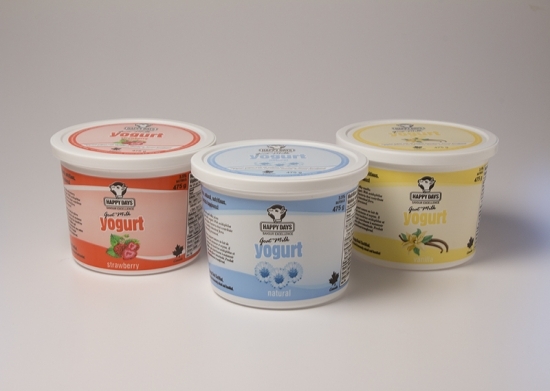 Happy Days Goat Milk Yogurt is available in Strawberry, Vanilla and Plain. Made with natural flavours and loaded with the highly beneficial bacteria acidophilus and bifidus. Yogurt, especially if used with these probiotic live bacteria, has tremendous positive influence on the digestive track. 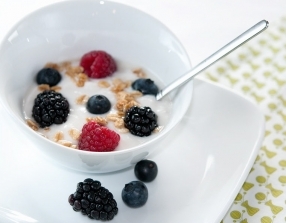 It is advisable that people who are on medication, especially antibiotics, consume yogurt to support their digestive system. We only use agar as a thickener, which is an ingredient derived from seaweed. Nothing artificial inside! We are proud to be the first dairy offering a Goat Milk Kefir. It comes in a plain and blueberry version. 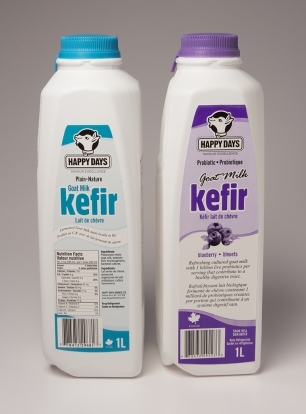 Kefir is a natural effervescence, producing gas; that's why we package it into a PET bottle. Shake gently before opening. Kefir is a world champion health product. There are many health benefits and just one tablespoon provides billions of live microrganisms. Fermented goat milk with beneficial probiotics that contribute to healthy intestinal flora. No sugar, additives, milk protiens, artifical or natural flavours added. Lactose and gluten free. Made locally in B.C. Kefir is called the drink of the centenarians.